This preview gives you a little taste of what makes this production so amazing: the puppetry, which was designed by the Handspring Puppet Company. All of the horses in the show are puppets, but the amazing part is that you quickly forget that these horses are puppets and not real horses. They really seem to emote and to move like real horses. It’s amazing that these puppeteers can make you care about puppets in this way! PJ and I were both astounded by this aspect of the play. It’s the magic of theater at its best. 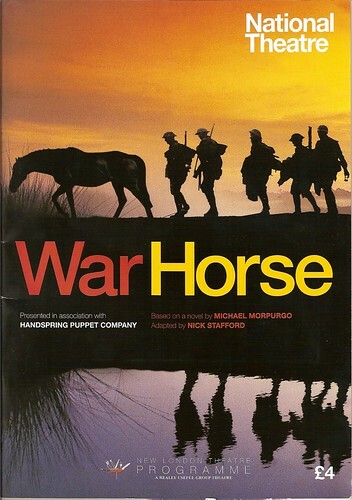 War Horse starts with young Albert being assigned to help raise a horse, Joey, that his drunken father has spent all of the family’s money buying just to spite his brother. When war is declared, the drunken father sees a chance to make a quick buck and sells Joey to the cavalry. Albert swears that he will find him again and bring him home. The rest of the play recounts Joey’s time at the front and details just how horrible the war was for these animals. Not only are they slaughtered by enemy machine guns but they are also used as beasts of burden even when they are not physically right to carry or haul the burden they’re given. Joey and another horse are eventually captured by the Germans, which doesn’t help their plight a whole lot. One of the interesting things about this play is that it seems fairly balanced in its treatment of both sides: some of the British are good to the horses, as are some of the Germans, and some members of nationalities are not. Albert does eventually run away from home and join the British forces at the front. By the time he arrives, however, the horse brigades have been disbanded and he’s left with only the barest of hopes that he will ever see Joey again. We wanted to see this play because it’s being produced by the National, which is always doing interesting work. But going in we were a little worried about the based-on-a-children’s-book part. Was it going to be too kid-oriented? Ultimately, this was a totally misguided concern: this play is appropriate for older children, but it’s not really a “kid’s play.” It’s very serious and dark and sometimes violent. Matthew Aubrey is excellent in the lead role of Albert. Rachel Sanders is also excellent as his mother. But the real stars of this show are the “horses.” They really are amazing. The two things I thought didn’t quite work in the production were some of the singing and the random birds flying across the stage (they were also puppets). Both seemed a little unnecessary at times. The bird puppets flying across the stage were sometimes a distraction, and I couldn’t always connect the folk songs to the action of the play. But that may have been more my fault than anything one else’s. But everything else was absolutely mesmerizing. I also really liked the way in which the production conveys the battle scenes and the landscape, most of which was illustrated through draws projected on the walls. Almost everything about this production was innovative. Overall, this was one of the highlights of our trip to England this year. It’s an excellent play and an outstanding production. (You can never go wrong with the National!) It will be transferring to Broadway at some point, and Steven Spielberg is making a movie of it. It will be interesting to see how it fares in the U.S. I definitely recommend it.